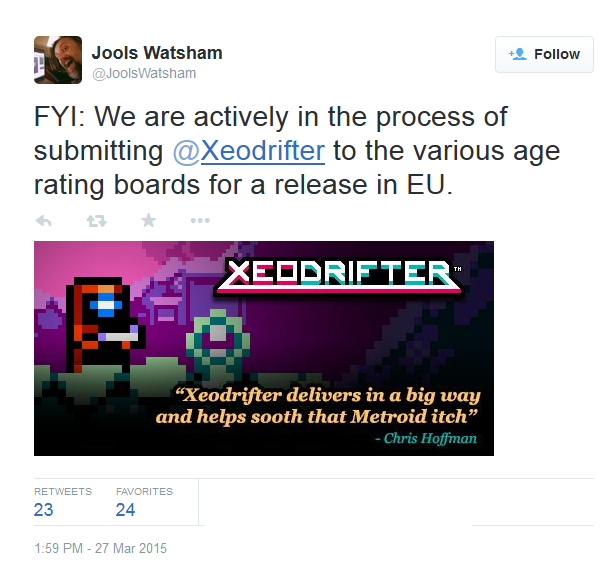 Xeodrifter being prepared for European release. Xeodrifter from Renegade Kid has yet to be released in Europe, despite being launched in America last December. This is partly due to Europe’s PEGI rating board having a harder process to certify games, not to mention it costs developers money to get the games certified unlike in North America (They use ESRB) where it’s free and relatively simple. Jools Watsham(Co-founder of Renegade Kid) has posted an update on Twitter about the European release, which should give Europe some heads up about it’s overdue release.